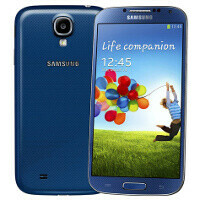 Just like it did with the Galaxy S III, a couple of months after the release of its new flagship, the Galaxy S4, Samsung has started releasing new color versions. Now, the Arctic Blue one has started arriving as an exclusive at Phones4U in the United Kingdom, but our guess is that in a short while it should be available elsewhere. The blue Galaxy S4 is sold both online and in Phones4U retail stores across the UK. The handset works on EE’s 4G LTE network, but it also supports T-Mobile, Orange and Vodafone's 3G networks in the UK. Samsung has officially announced five new color shades for its Galaxy S4. The handset will arrive in brown for Verizon Wireless in the United States and purple for Sprint. The five new colors are creative called Blue Arctic, Purple Mirage, Red Aurora, Brown Autumn, and Pink Twilight. Blue one is a looker, I liked it on the LTE-A videos.